I can understand as a commuter why Cindy started this blog, because no matter what route you take on a daily basis there is always a story to tell. I think that is definitely the case on the 501 Streetcar route in Toronto. 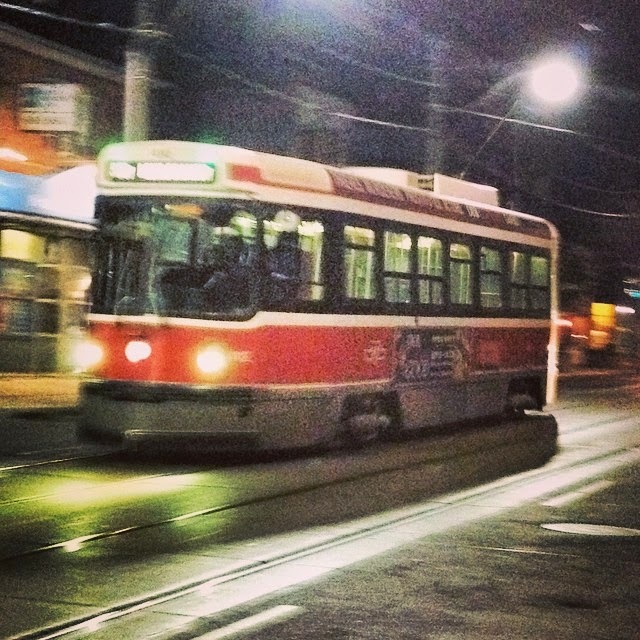 It's known to be the longest streetcar route in the world, but more than that for me, some of the most entertaining, obscure, and inspiring moments have occurred on that very route. This morning, the streetcar stopped at Queen and Sherbourne. Kevin Clarke was standing on the southeast corner. He's a homeless mayoral candidate who I have only heard of and never seen before. He tags graffiti all over the city about his mayoral run. He took advantage of the red light, and stopped packed streetcar to unleash his mayoral platform. In an impassioned tirade, and the short time it took for the light to change to green, he wonderfully projected a keen diatribe of why he was the best choice for mayor and how he would better the city. A packed 501 streetcar full of commuters on their way to work definitely heard him. He was talking directly to us, I give him full props for taking advantage of the moment to have an audience. Some disregarded him, some pretended not to listen but did, some laughed at him, and some were flat out freaked out by him. I had a window seat facing south, and made eye contact with him, gave him my full attention, and was thoroughly impressed. I flashed him the peace sign as the streetcar pulled away, and he returned it. I truly wonder what he would be like in a debate, who knows, I can say he's ten times more eloquent than Doug Ford but then again so is Buster the lobby cat in my building. Still I love riding the 501 because of unexpected moments like that one, and I am not saying that I will mark an X beside his name. But I gotta say, that likely will easily be one of the coolest moments that happened today, he may not have my vote, but he certainly got my attention and then some.